Please Note: This documentation applies only to the current version (v2.5.1 and above). If you’ve purchased prior versions from DigiEffects, they’re no longer supported and do not work properly in the latest versions of AE. So, please upgrade. Buena Depth Cue v2.5 provides After Effects artists with an innovative workflow for creating visual depth in their projects. Using composition-based effects, such as Rack Focus, Falloff Lighting or Atmosphere, digital media artists can mimic Z depth in a unique way that cannot be replicated using After Effects depth of field. Buena Depth Cue V2.5 includes 6 powerful plug-ins for creating depth. 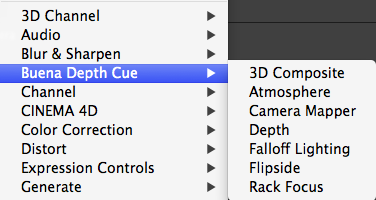 You can apply all the effects from the Buena Depth Cue bundle from the menu Effects > Buena Depth Cue. If Buena Depth Cue isn’t registered you’ll see a watermark rendered by the plugin. To remove the watermark, you have to register the plugin with the serial you have purchased. To register, click on the “Register” button in the effect controls window. Often, when you’re using 3D plugins on a 2D layer, After Effects will complain that you can only apply 2D effects onto 3D layers. When that happens, select “Once per session” from the drop- down menu of After Effects’ dialog window to keep these messages to a bare minimum, and click OK to make the dialog go away. The plugin name itself may show a yellow cube with an exclamation mark inside. You can safely ignore all of these warnings. Please go through the following chapters of the manual, to understand more about this plugin suite.